For our extensive FAQ section on AGOA, please follow this link. The African Growth and Opportunity Act (AGOA) is a United States Trade Act, enacted on 18 May 2000 as Public Law 106 of the 200th Congress. AGOA has since been renewed to 2025. The legislation significantly enhances market access to the US for qualifying Sub-Saharan African (SSA) countries. Qualification for AGOA preferences is based on a set of conditions contained in the AGOA legislation. In order to qualify and remain eligible for AGOA, each country must be working to improve its rule of law, human rights, and respect for core labor standards. The AGOA eligibility requirements are listed in more detail at this link. 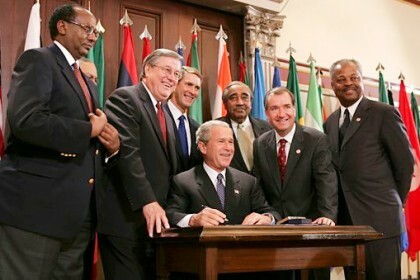 The Act originally covered the 8-year period from October 2000 to September 2008, but legislative amendments signed into law by US President George Bush in July 2004 served to extend AGOA to 2015. At the same time, a special dispensation relating to apparel was extended by three years to 2007; but in December 2006 these were extended to 2012. In 2007, the apparel “abundant supply” provisions were enacted, although these were repealed again in 2009. Their intention was to set requirements for local textile fabric sourcing where it was considered that sufficient quantities were available in AGOA-eligible countries; third country fabric (the provisions related only to denim initially) would thus first have to be sourced locally or regionally before third country imports could be utilised for onward exports of denim garments. A subsequent legislative revision in September 2012 extended the apparel provisions to the end of 2015 to coincide with the current expiry of the AGOA legislation. The apparel provisions are unique in that they grant countries defined by the legislation as “lesser developed”, being those that meet certain income thresholds (GNP < $1,500 per annum in 1998) and which have implemented a special apparel visa system, favourable rules of origin (RoO) requirements. Details for these in the ‘Apparel Rules of Origin’ section. AGOA builds on existing US trade programs by expanding the (duty-free) benefits previously available only under the country’s Generalised System of Preferences (GSP) program. Duty-free access to the U.S. market under the combined AGOA/GSP program stands at approximately 6,500 product tariff lines, including the tariff lines that were added by the AGOA legislation. Notably, these newly added “AGOA products” include items such as apparel and footwear, wine, certain motor vehicle components, a variety of agricultural products, chemicals, steel and many others. After completing its initial 15 year period of validity, the AGOA legislation was extended on 29 June 2015 by a further 10 years, to 2025. A related news article can be viewed at the following link. Top sub-Saharan African suppliers to the United States were South Africa ($7.8 billion), Nigeria ($7.1 billion), Angola ($2.6 billion), Cote d’Ivoire ($1.2 billion), and Botswana ($772 million). US investment in sub-Saharan Africa stood at $29 billion in 2016, the latest year available, down 23% compared to $37.5 billion in 2014. The three largest destinations for U.S. investment were Mauritius ($6.7 billion), South Africa ($5.1 billion) and Nigeria ($3.8 billion). Sub-Saharan Africa foreign direct investment in the U.S. stood at $4.2 billion in 2016, up 164% compared to $1.6 billion in 2014. US President Obama signing the AGOA Trade Preferences Extension Act of 2015 into law.